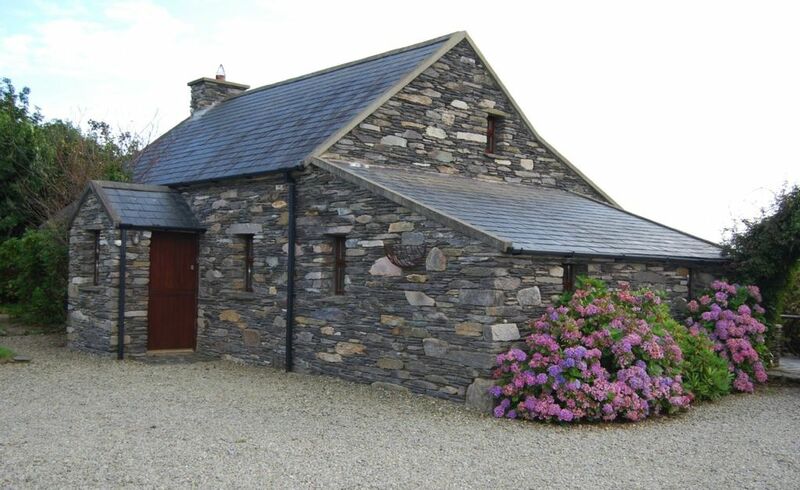 Traditional style stone cottage,sleeping 2/6 near Schull/Goleen,West Cork. Traditional style stone cottage,situated in a quiet private rural setting close to the beautiful West Cork coastline. Fortview Cottage is just 6 miles from the small fishing village of Schull with its many pubs,restaurants & shops.The cottage 3 miles from Ballyrisode beach. Mizen Head and Barleycove beach just 25minutes drive. The cottage is furnished with antiques and all modern comfortsThe cottage has wireless Internet access.. Linen and towels provided.This is the ideal location for exploring West Cork and Kerry.Cottage available all year round..
1 Ensuite in Master Bedroom. 1 Main Bathroom with Bath. The cottage is suitable for the elderly or infirm but it is not wheelchair accessible. Change over day is Saturday during the High Season but during the Low season it is very flexible. nice place a bit basic and would have been nice if host could have left a drop of milk for us on arrival, this place isn't exactly over run with 24hr stores. Fabulous holiday, lovely hosts, great cottage, amid the cows. A find for us. An adventure from the start, how beautiful is this area! Loved the cows, and the countryside. Very quiet - just what we like. The hosts are most welcoming and helpful. We had a great week exploring the area. The cottage was all I could hope for and we felt at home immediately! Dunmanus bay is beautifull at any time of day as well as the rest of the surroundings, we can also recommend the Sheepshead walking and the Ring of Beara! Violet is a great host, helpfull and generous (and a great cook!). We surely would recommend it to friends and want to come back ourselves also! There is still so much to see en enjoy! Our family of 5 stayed at Fortview Cottage for 3 nights on the last leg of our 10 day Ireland trip this past June. We stayed at 2 other cottages during the trip and this cottage was the most lovely. It has that rare combination of up to the minute conveniences (e.g. Wi-Fi) and rustic authenticity (e.g. salvaged stones exterior). And we loved the location at the edge of a pasture with our own cows to watch and many country lanes to explore. The Connells were helpful but unobtrusive, the place was spotless, the welcome wine was a classy touch, and we would not hesitate to return and to recommend the cottage to others. A wonderfull and very lovely cottage! We enjoied our honneymoon-holliday in the fortview cottage! It is absolutely wonderfool and charming, tastefully furniged and with a kitchen where you find all you need for preparing the meals. We never had a better hollyday home before! it was a dream to stay there in the calm country side. you are close to lovely villages like scull and bantry where you can get everything and where you meet so friendly people! we made a lot of tours, the seaside is very beautiful and we also were very lucky with the weather! At the cottage we enjoyed the garden and all the animals arround and the absolut silence! Violet Connell ist a very charming land Lady she helped us a lot and was always so friendly! We can recommend this place anytime and we will go back as soon as possible! We still enjoy remembering every day this wonderfull holliday! thank you Violett trusting us and for all you have done for us! this was the best holiday and the right place for us!! Cottage is located just 6 miles west of the small fishing village of Schull. The cottage is situated between Schull and Goleen just 2 km from Toormore. If you would like to check availability/prices or have any other questions please contact us... Linen, Towels & any household linens are included in the price. Electricity & Heating Oil are extra. Check in time is anytime after 4pm or by arrangement, Check out time is strictly anytime before 10am ..Cottage must be left in a clean and tidy condition on departure.